Autumn is one of those times of year that is bittersweet for me. I am sad that the Summer has come to an end & I dread the start of Winter. Yet, I still look forward to a chilly autumn breeze drifting in & wrapping up in chunky knit scarf for the first time in months. I love the changing colour of the leaves, I love hot cinnamon lattes to warm up with & I love the warm colours that are all over the stores. I needed to update my Autumn wardrobe & my key colours this year are berry & wine colours. Primark managed to feed my craving today & I picked up some beautiful wine coloured leggings. I am excited to work this colour into my wardrobe as I do not have many ‘autumn colours’ in my collection so far. 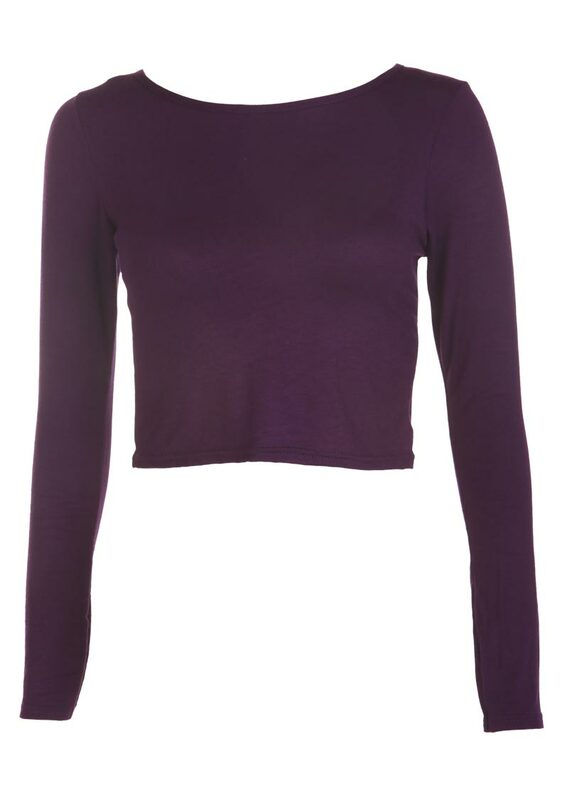 I also purchased a plum coloured crop top, kinda like the one pictured above. This is another colour that I am excited to play around with. I also bought a red & black velvet top from Primark – I know it sounds awful! Fear not! It is super cute & creates a dark romantic vibe that I love. Velvet is something I have been keen to try & wear, in fact I almost bought some velvet leggings last week but I backed out. This top however, is a great way to slowly introduce myself to the world of velvet & test out the trend before I dive in! I will take some pictures of my new purchases & post them soon. What colours are you looking forward to wearing in AW13? Both are fabulous color sand very comfy looking clothes– I now have some shopping to do!! Go for the velvet leggings! !It;s a different purchase and I think it would create a unique style! !About the colours I’m most a black and white lover but I’d like to buy sth at the colour of wine as you mentioned!! I will be looking for lavender and red wardrobe inputs. Those are great leggings. I love the maroons and purples, they are so lovely and warm looking! You are right on! I’m all about this color to add to everyone’s wardrobe this season! Rock these pieces under that biker coat and shoe boots!